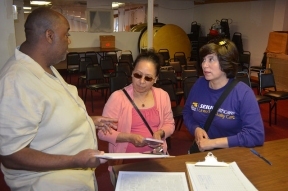 On Saturday, June 14, home care workers, child care providers, hospital and nursing home workers gathered in Lawndale at the Grace Memorial Baptist Church to kick off a summer of planned activities around registering new voters and winning an increase to the minimum wage. Training on how to register a new voter preceded a speak-out session where two home care workers shared their personal stories of struggling to get by on a wage higher than $8.25. Melody Benjamin, a home care provider from Chicago’s west side, brought along her budget to illustrate the tough decisions she faces every month, choosing which bills to pay while still keeping food on the table and a roof over her head. “I support an increase to the minimum wage because I look around my community and see my neighbors are struggling just like me. Our neighborhood is plagued with crime and violence, and I think the first step to addressing these issues is ensuring there are living wage jobs available that people can support a family on,” explained Benjamin. OJ McGee, a home care worker and CNA, also spoke out for the need to win a higher minimum wage. “I’m a single dad trying to raise my son the best that I can. I have to work multiple jobs to get by because wages are so low. If we can raise the wage for those at the bottom, we will all be better off,” said McGee.